Maxi dress with pockets,maxi dresses for women summer,long dresses maxi,long dresses with pockets. Material: 95%Cotton 5%Spandex. Super soft, stretchy and lightweight. Comfortable to wear. Color: Black, Green, Wine Red, Coffee, Navy Blue, Blue, Red. Pattern Type: Solid Color, Swing Dress, Flowy, Loose Plain. Colors may appear slightly different via website due to computer picture resolution and monitor settings. Standard US size. Please just choose size as your normal wear. Size chart? Material: 95%Cotton 5%Spandex. Super soft, stretchy and lightweight. Comfortable to wear. Maxi dresses, long dresses, summer dresses with pockets. Perfect for spring, summer and fall. Features:casual wear, floor length, short sleeve, crew neck, loose plain and two side pockets. 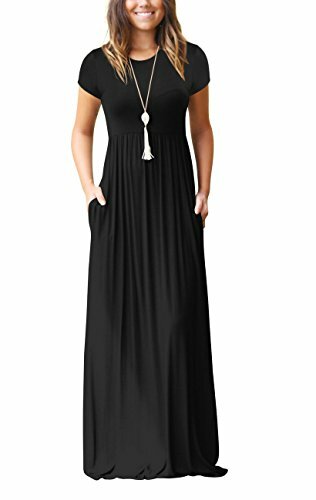 Simple design maxi dress for women,easily dress up. It will make you looks more beautiful,fashionable,and elegant. Standard US size. Hand wash or gentel machine wash / Do not bleach / Line dry.